Running from darkest to lightest color - all grown in between 2-5 gallon containers - one day's harvest. Part of my Orient Express dehybridization project or my Green Ghost (Casper X ??) dehybridization project...such fun! Most unusual is the purple streaking over green background. Very nice! They look delish! thanks - roasting some now for Baba Ganoush - last night roasted a bunch for Bangan Bartha. 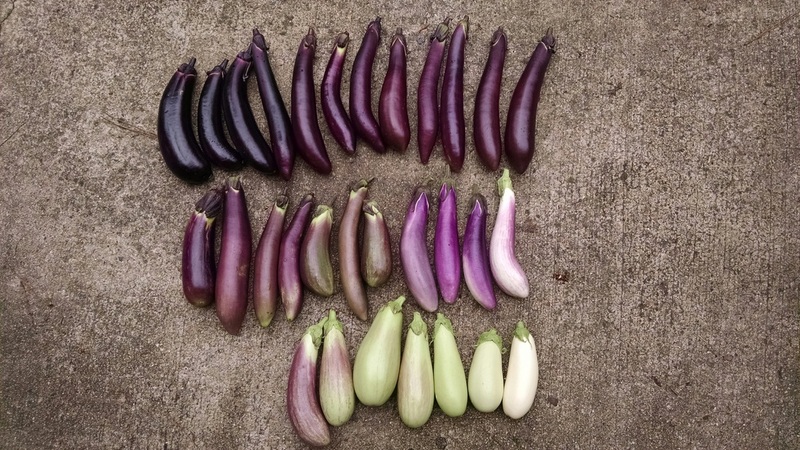 So many more coming - pulling out all the stops on the eggplant recipes! Two of my favorites! Eggplant Caponato is also a good one. I like them grilled with olive oil, basil and garlic. Makes a nice, low-cal treat, even when cold.